I have a Christmas Secret. I’m revieling it to you, my followers since I know you won’t tell. I have drawn my mother-in-laws name for our secret Santa Christmas. Now this is indeed a big secret because my husband’s family takes figuring out who has whom as a challenge. So, here is where I will find out if any of them have found my blog yet. Back to my secret. 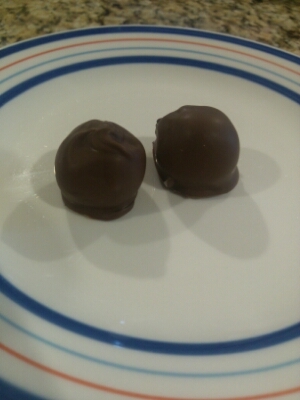 From previous years experience I know that my mother-in-law loves my homemade chocolate covered cherries. So naturally, a part of her gift will be two dozen of these time consuming treats. Shh…she has no idea. Here is how these tasty time consumers are made. First mix your fondant. My recipe calls for 3 Tablespoons of melted butter and corn syrup. 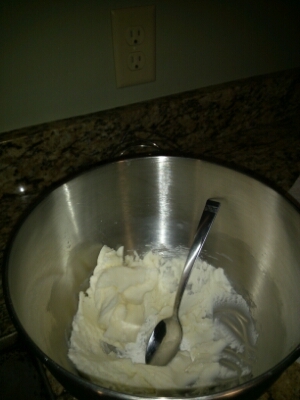 Then add two cups of powdered sugar. It will form into a thick fondant. Chill this for an hour in the refrigerator so it is easier to work with. While your fondant is chilling open up your maraschino cherries and drain them. Next lay them on paper towel. Try to get as much juice off of them as possible. 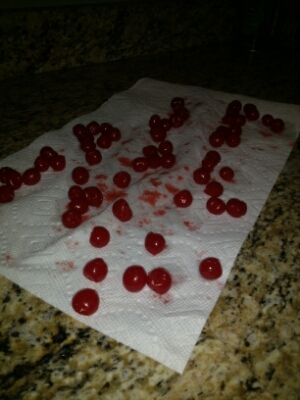 I had two jars of cherries. This will give me about 60 chocolate covered cherries in the end. Once your fondant is more firm grab your cherries as well. Take about a teaspoon of fondant and smash it flat in the palm of your hand. Place the cherry in the center and wrap the fondant gently but securely around the cherry. Be sure to fully coat the cherry. Lay them on a baking sheet and place them in the refrigerator to firm up again. Finally grab some coating chocolate, this would be a dipping chocolate as well. Melt a few squares and stir it will to ensure you have no chunks. With a fork, dip the fondant covered cherries into the chocolate and coat them well. Tap your fork on the bowl edge to help tap free any excess chocolate. 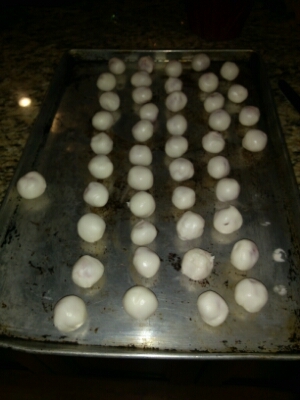 Place coated cherries back on the baking sheet but be sure to lay down wax paper under them. 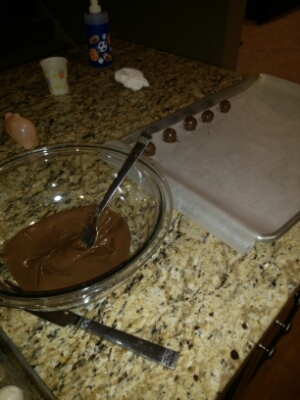 Put them in the refrigerator and let them sit over night or for a few hours until the chocolate has set.